Sprigs of Rosemary: Let's Hear It for St. Joseph! And Zeppole! Let's Hear It for St. Joseph! And Zeppole! I've always wanted to make these, but haven't had a group big enough to cook for...and I don't think I could eat that many in one sitting! And I never knew about St. Joseph, poor guy. Your zeppole look very good for me. I like this type of sweets, but I don't cook them very often. I use confectionery sugar with vanilla for dusting. 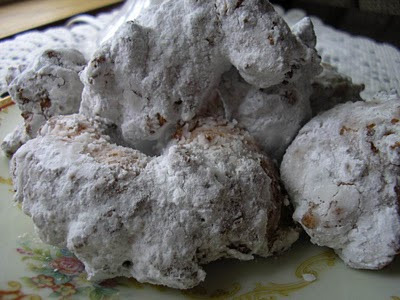 Never had Zeppole - I will have to mark St Joseph's day in future so I can try out these delicious morsels. There is a zeppole recipe for every town in Italy! It's just fun to try them all. Yours look sweet and inviting and I would be pleased to have 2 or 3. I imagine St. Joseph doesn't eclipsed in Italy! I just found your blog over on Claudia's Italian Cook, and am now following you. I think it's great that you made these for St. Joseph's Day. I did not forget, I just didn't have time because I was in the garden all day. Thank you for sharing this educational post for others to know about this great day. Hope you can stop by sometime. 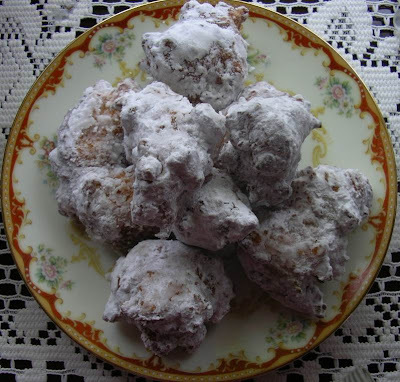 your Zeppole look delicious, I would love to try them! I work at a school run by St Joseph nuns, so when it falls during the week we have it off too! It makes it an extra good reason to celebrate it! I think that any day where delicious food is involved is cause for celebration!!! Those zeppole look delish! I could easily eat a dozen! I look forward to this day every year.. I love this picture here these are perfection!. I make a different region version every year but my favorite is the cream puff style. Your recipe ingredients are just perfect for the fritter style. ITs an amazing story just wish I was in Italy to enjoy the feast! Happy St Guiseppi Day! Wow! I'm in zeppole heaven! These look delicious! I'm your newest follower via Claudia and Roz! Rosemary-Thank you for reminding us that it's St. Joseph's Day, and to think we have at least 4 Josephs in our family! Your Zeppole is so beautiful, and delicious. It really inspires me to make them for a special occasion, and not wait till next year! I really enjoyed reading your post, as well. I am so happy you posted this recipe. Boy, does it bring back memories. I grew up in Navy housing and so we were used to our friend's Moms being from all over the world. My friend's Mom, Rita, was from Italy and I clearly remember her making these for us kids. We never said it as well as she did in her Italian accent...lol. These look exactly like what she made. Thank you for taking me back. I had forgotten all about these treats!! Is It Real Irish Soda Bread?